Google is making a major play for local online advertising in an attempt to reach the millions of businesses that want to attract nearby customers, according to Advertising Age. After struggling to break into radio, print and TV advertising, Google is now targeting local online advertising by both national brands and smaller community businesses. “It’s a huge opportunity where we can do things we haven’t done before,” said Susan Wojcicki, Google’s senior VP-product management and the search giant’s top ad products executive. In recent months, Google has released a stream of new local services and ad formats while expanding others. It recently updated its search engine to make local businesses and listings much more visible and reassigned a top company executive, Marissa Mayer, to developing new geographic and local services. Google’s primary goal with local advertising is to anticipate users’ needs and help them find something useful without having to ask for it. If Google is successful, they would be rewarded well on the ad side. After all, the online segment of the $91 billion local business will grow 18% this year, to $15.9 billion, according to market researcher Borrell Associates. This is greater than the 14% growth forecast for online advertising overall. The rationale is that the one piece of data that may work best to attract potential customers is location, which advertisers are well aware of due to the explosion of net-connected mobile phones with GPS and location-based mapping networks such as Foursquare. Google’s focus on local advertising is also a defensive move. New marketing channels and methods, ranging from Groupon to Facebook to Yelp, offer merchants and service providers easier and often less expensive alternatives to Google’s search ads. In fact, Facebook just became the most-popular marketing channel for local businesses, with 70% using it compared to 66% using Google’s search ads, based on a recent survey of 8,500 businesses by MerchantCircle. In an attempt to remedy the many difficulties that Google has faced with local advertising since its first efforts in 2005, the search giant has rolled out two new ad formats. The first is Tags, which lets merchants buy a yellow pushpin on Google.com and on Google Maps highlighting their location for $25 a month. Already, tens of thousands of businesses are using them. The other product is Boost which lets advertisers complete a short business description, list a web page or free Google Place page listing, and set a budget as low as $50 a month, and then the system creates a continuous, automated search campaign. To sell these ad products, Google has taken the surprisingly traditional approach of having hundreds of salespeople hit the streets and show up at the doors at local businesses. While Google is working hard to secure local advertising, its rivals are also fighting for a share of local business. 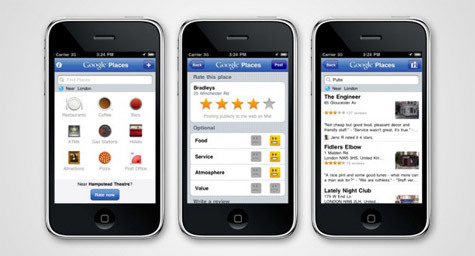 Yelp attracts 45 million unique visitors a month to its 15 million reviews and sells advertisers bundles of enhanced listings pages and search ads for $300 to $1,000 a month. Facebook has introduced enhanced “Pages” for businesses and other groups, location check-ins and promotional deals, along with the locally targeted ads it has always offered. Pay-per-call ad startup Yext launched a $99-a-month program that lets small businesses place a yellow tag similar to Google Tags on a dozen local-listings sites. Then there’s Groupon, who has grown to more than $500 million in revenue in less than two years, mostly on deals from local businesses. With such intense competition for local online advertising, Google has to prove that they’re the better advertising partner if they want to attain a better part of the local business.